in 1914-18 bought E type, that had 1000 V motors (# 38-62); later it recieved by BHÉV M V type and numbers M2038-M2062. 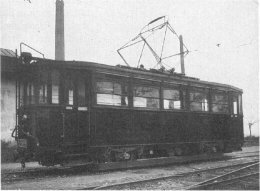 The BKVT's V type tramcar (# 1047) still in the Ganz factory. 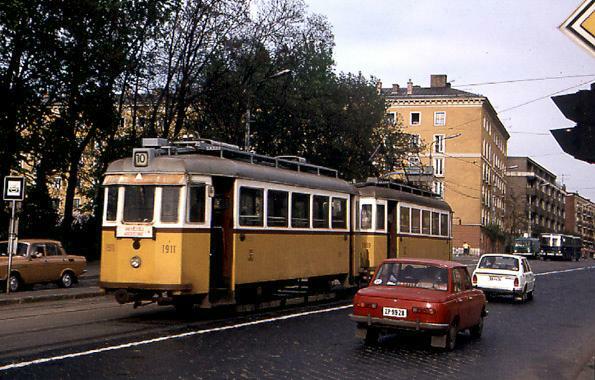 These cars were the largest and most powerful cars of BKVT, so they ran on the busiest sections. 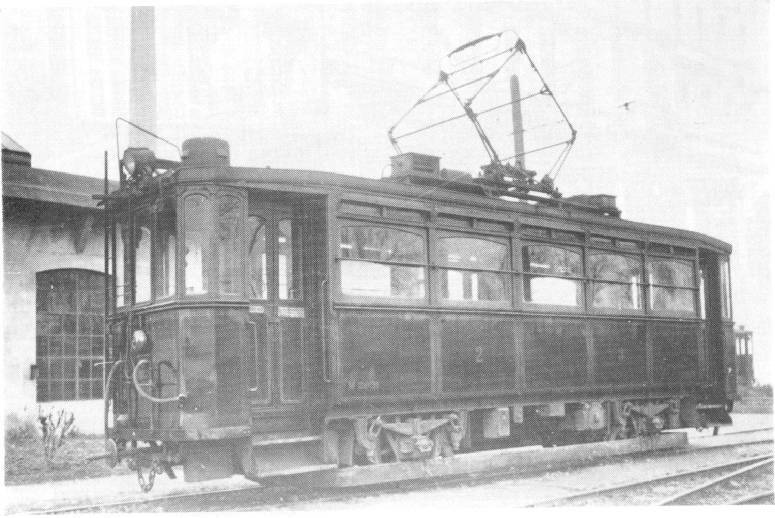 The BHÉV's # M2031, M IV type (BBVV U type) motor car in Budafok depot. 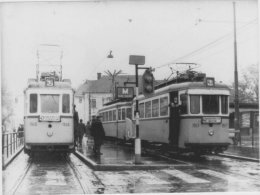 These cars ran on the Nagytétény line, that was electrificated with 500 V.
The BBVV's # 47, E type (later M V type) car in Budafok depot. 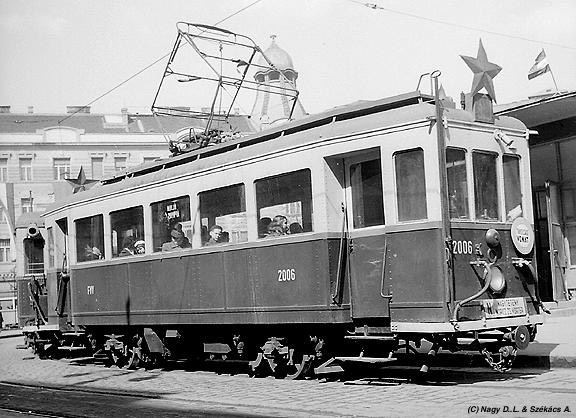 These cars ran to Törökbálint and later on all lines of the Budafok BHÉV line. 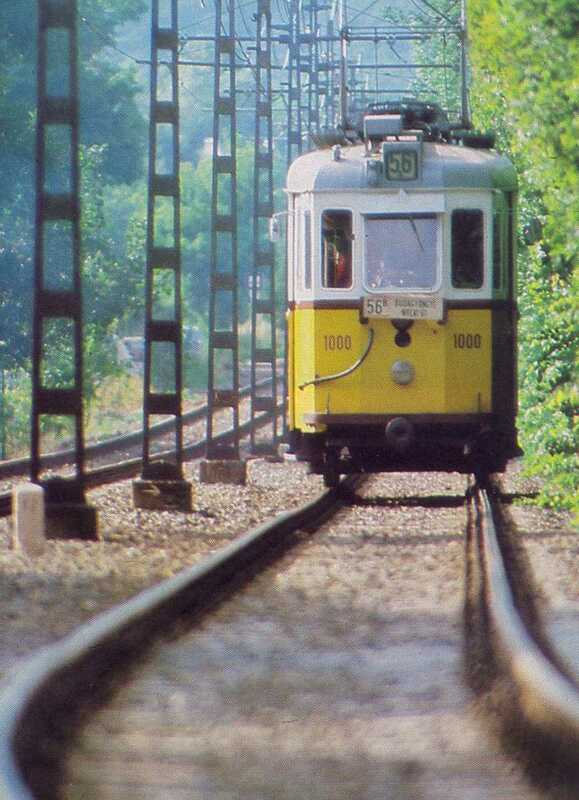 A long section was electrified with 500 V on this line, so these cars ran only extremly slow at these sections. 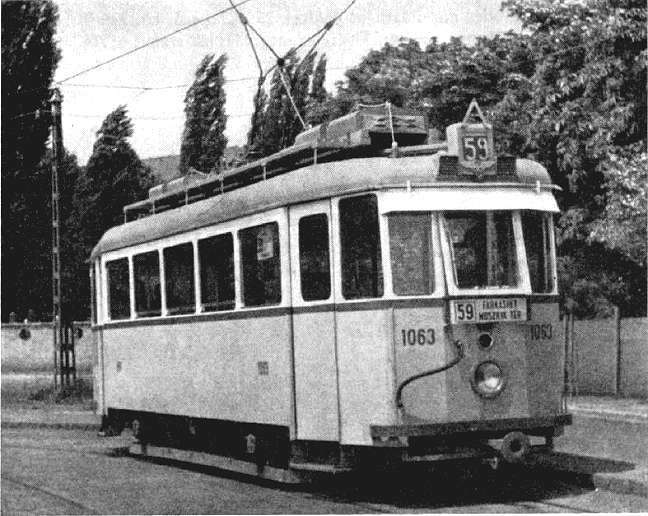 In the terminus of Zugliget (line 81, later 58) tramcar # 1050. In 1939 30 cars were reconstructed for gradient tracks of line 59 and 81. 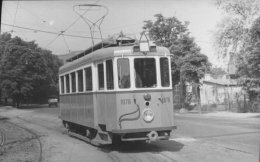 The cars were supplied with magnetic track brakes, wich operated also in case of using the rheostatic brake. 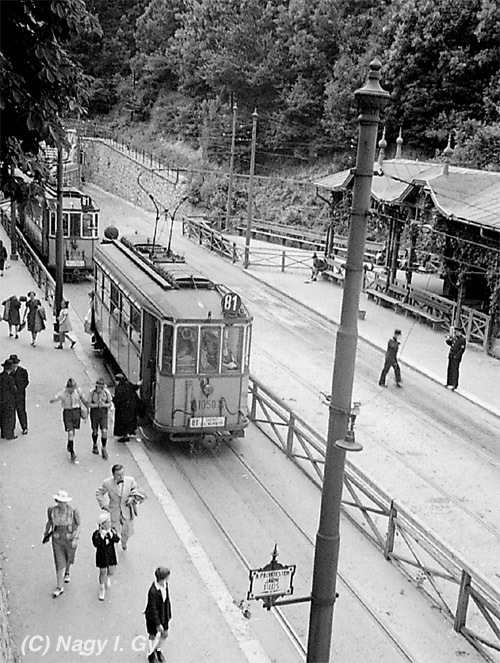 Furthermore the cars couldn't roll away on the hills, because the rheostatic brake operated automatically. 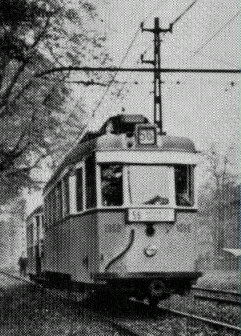 The V type recieved a uniform steel body from 1958-61. 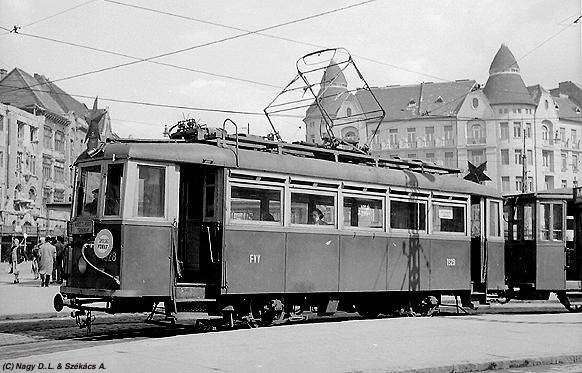 A wooden framed car # 1063 at Nagyvárad tér, at the terminus of line 63 in 1958. 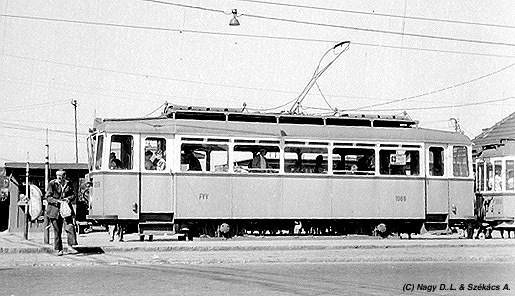 At the same place, same year, on the same line a steel bodied car # 1069. 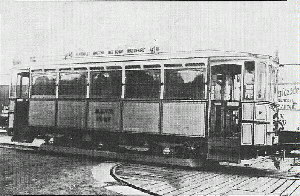 The # 1063 with steel frame. 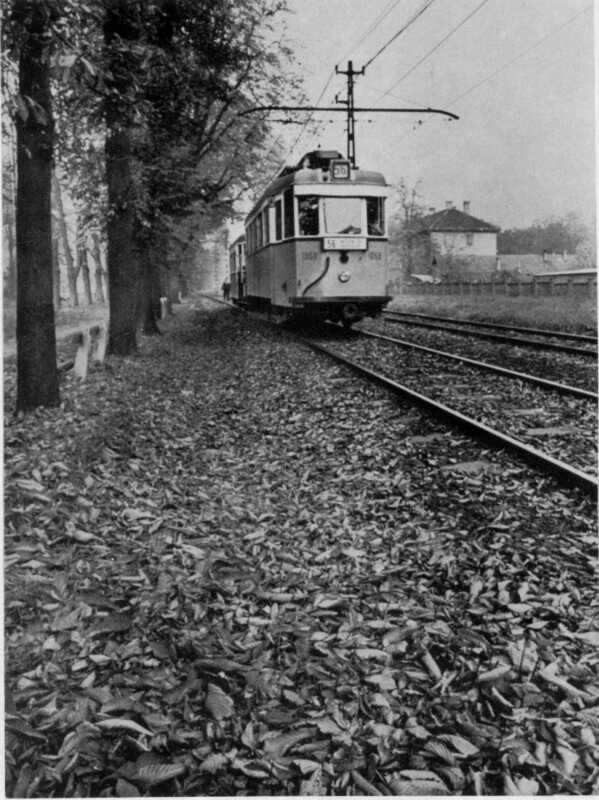 The car is near the terminus of line 59 at Farkasrét (around 1960). 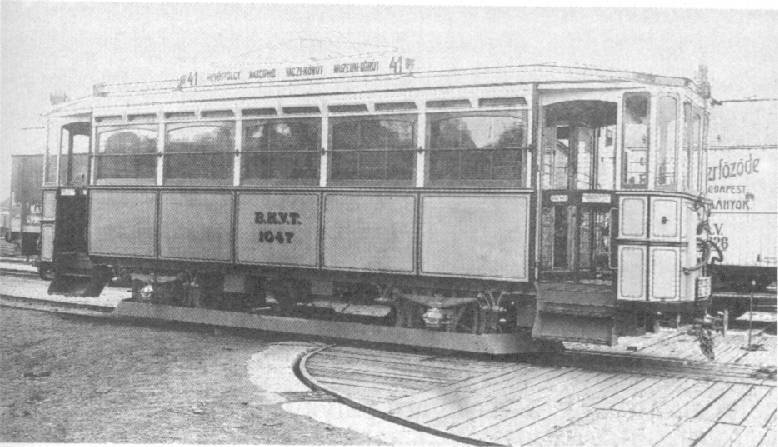 The # 1076 right after rebuilding with steel frame. 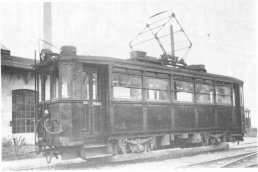 It is standing in front of Szépilona depot. The M IV cars recieved an early version of steel body between 1938-51. 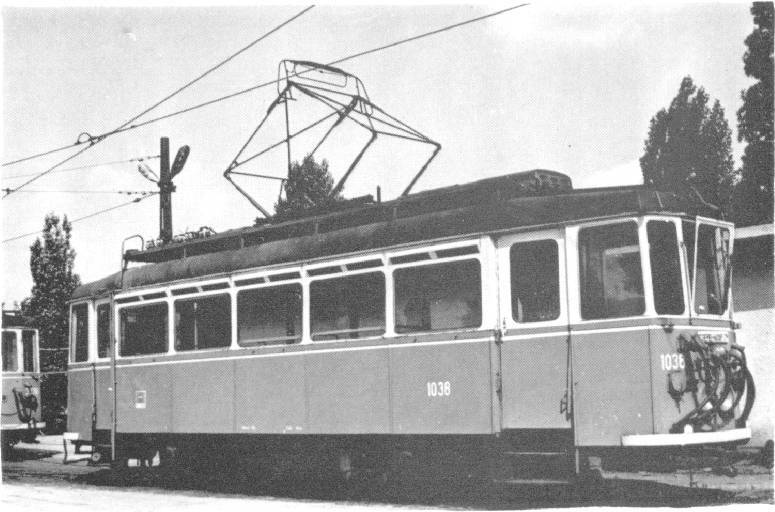 The M V type cars recieved also the uniform steel frame in 1956-58. A steel-bodied M IV type motorcar # 2006 at Móricz Zsigmond körtér, on line N to Nagytétény, pulling two four-axle trailer. 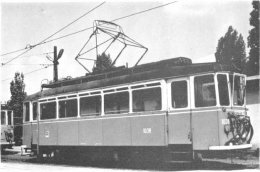 From 1938 the Nagytétény line's voltage was changed to 1000 V, so the M IV type recieved more powerful 1000 V motors - so on the inner section (from Albertfalva to the Móricz Zs. 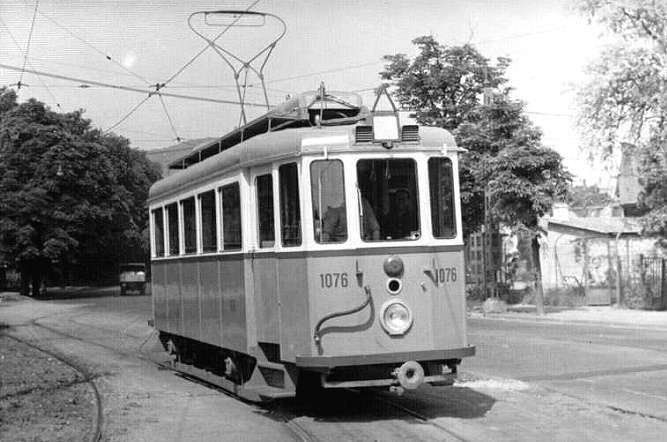 körtér) of the line these cars ran also half-speed on 500 V. The M IV cars were in use until the mid '70s on BHÉV lines. This is a steel bodied M V type car # 1928 Móricz Zsigmond körtér, on the HÉV line T to Törökbálint in 1957. The car pulls three small trailers. 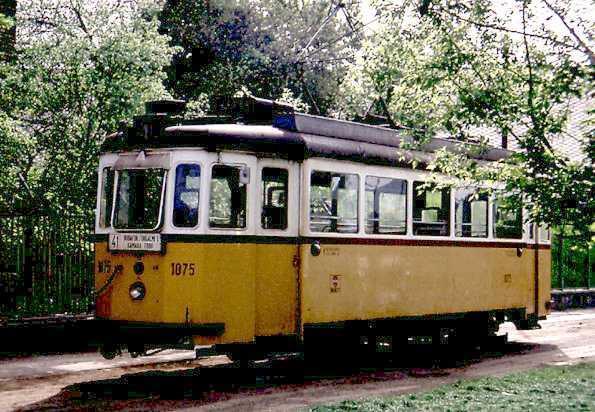 To make these trains go faster, from 1950 the interurban trains skipped some of the inner 500 V section's stops. 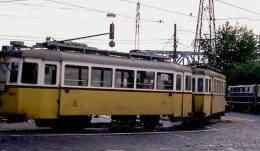 The M V # M1038 EMU in Csepel depot (in the '70s). 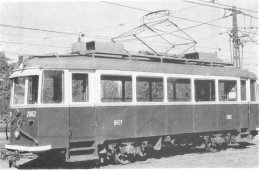 Two cars was rebuilt two a multiple unit EMU. They ran with two trailers in the rush hour, but they could be separated to two motor + driving trailer units. 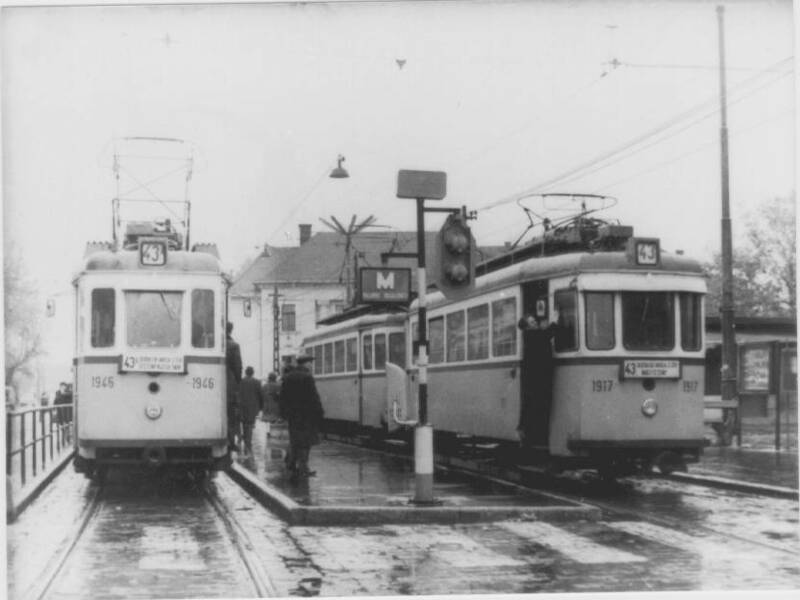 Four M V cars stayed on BHÉV, they served the H line from Csepel to Pesterzsébet. 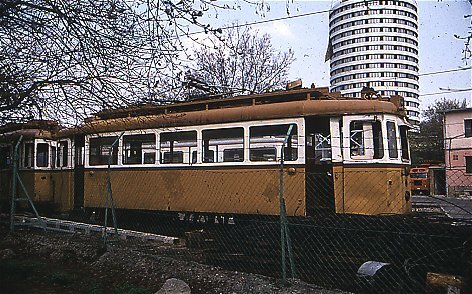 The M V type # M2062 in the '70s in Csepel depot. The only car, that could run full speed on 500 V section was the M2062, since it had 500 V motors. 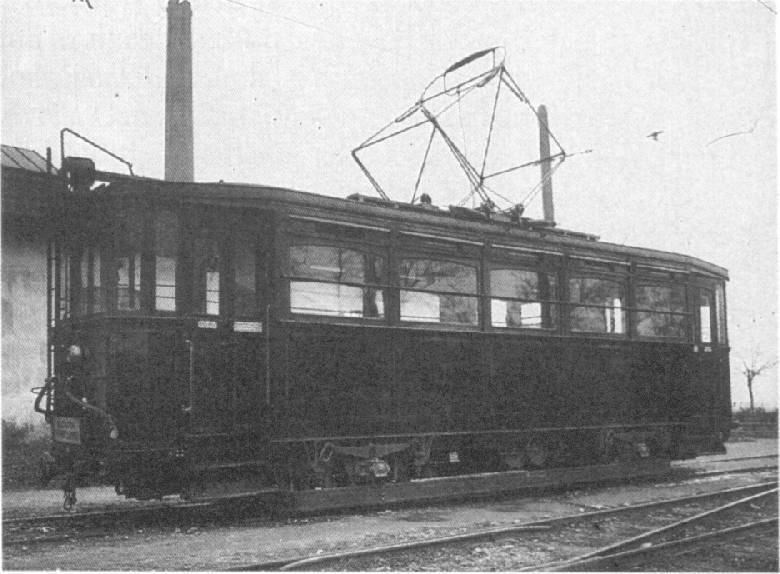 On the outer section on 1000 V the motors were operated serially coupled - again in full speed. 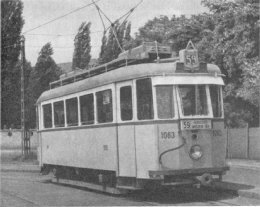 The Budafok line was taken over by the tram co. FVV - this time the 1000 V sections were converted to 500 V. To use the M V cars, they needed 500 V motors. So the company decided to convert same pieces of 1000ers and M V cars to twin units: so from each twin unit they recieved two motors, wich could be applied to the M V units. 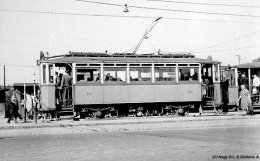 The controllers were supplied from the M Vs.
Twin cars # 1916+1917 & # 1946+1947 on the terminus of (partially single track) line 43 and 43A in Budafok (early '70s). 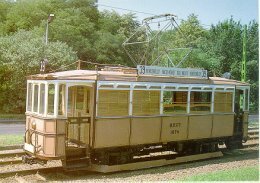 The # 1916+1917 has different current collector (the pantograph is for the usage, the lyra is in case of collector break). 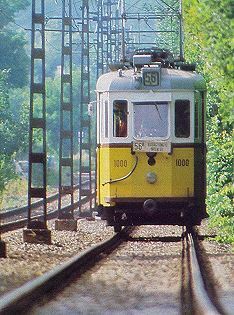 This is the line formally was the Nagytétény BHÉV line. 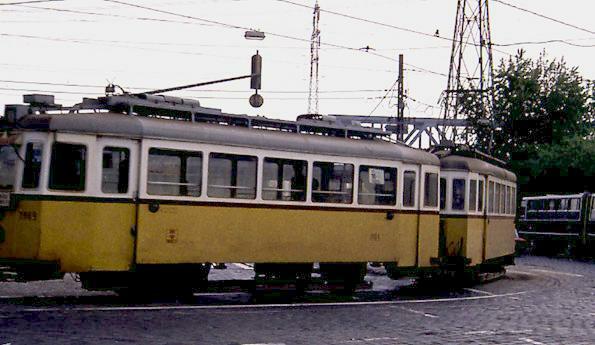 A twin car in Újpest, Árpád út coming from the Újpest depot to serve on line 10 (early '80s). On these cars later operated only one pantograph for both directions. Twin car # 1911 in Árpád út on line 10. This car also comes from depot, since it has a red table. These cars were scrapped until 1984. 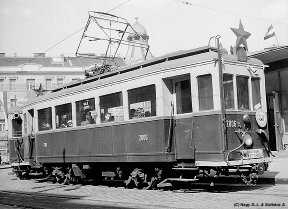 The 1000ers were the last two-axle motorcars in use until 1984. 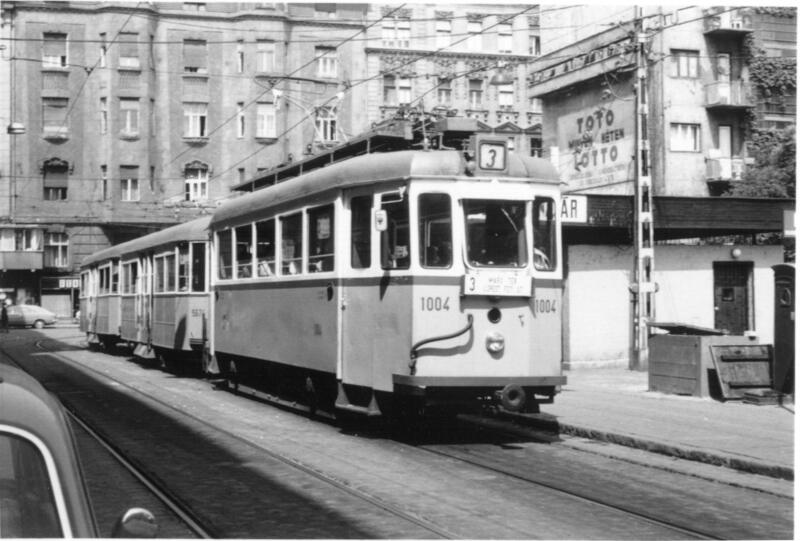 # 1003 in Kádár utca (Nyugati pu.) at the terminus of line 3 (mid '70s). On the line 56 (# 1068) pulling one trailer (mid '70s). 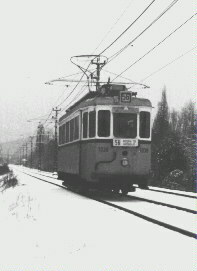 # 1038 on the line 56, in Versec sor (early '80s). 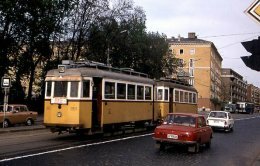 One of the last surviving car is # 1000 on line 56B (early '80s). 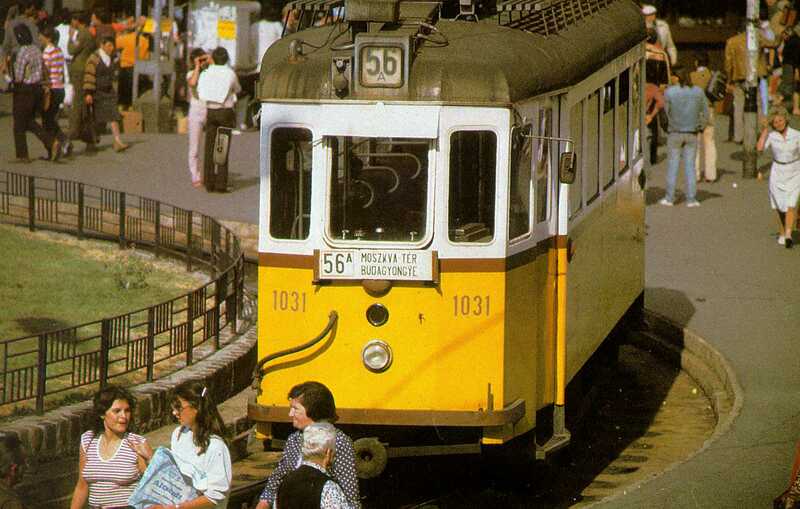 56A, Moszkva tér # 1031 (early '80s). # 1075 on line 41 terminus at Budafok depot. The last cars of the type V was in service on line 41 in 1984. 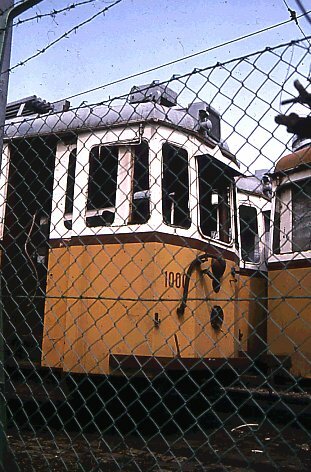 # 1000 scrapped in Városmajor depot of the cog-wheel railway (mid '80s). An unknown 1000er in Városmajor. The # 1074 in Hűvösvölgy. 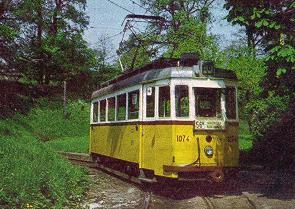 The # 1074 rebuilt back to its original wooden-frame outlook on the Krisztina körút ('90s). 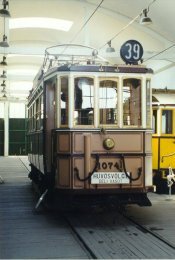 The # 1074 in Szentendre, in the Museum of Urban Transport ('90s).